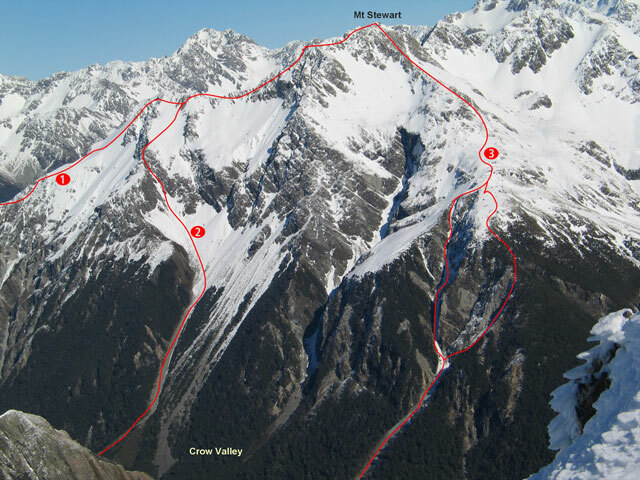 Mt Stewart sits at the end of Jellicoe Ridge, above the lower Crow valley. Reached by the stream which drains the Jellicoe Ridge 1km downstream of the White River conßuence. Moving east onto the tussock slopes once clear of the bushline, head towards the saddle between Mt Guinevere and Mt Stewart. Both mountains may be reached via this route on their respective ridges. From the confluence of the Waimakariri and Crow Rivers. An alternative route follows the slope opposite Greenlaw Creek to access the bush line and then sidles east into the south basin and on to the Low Peak. Climb the narrrow scree gut leaving the Crow River 150m downstream of the major creek that drains the basins under Mt Guinevere. Ascend 500m then break left or right up the loose steep ground to join the easier slopes of the North East Ridge to the summit.